Finn Wolfhard as Mike in Stranger Things. Eleven (Millie Bobby Brown) and Mike (Finn Wolfhard) will be in a relationship when Stranger Things returns for Season 3 on Netflix, executive producer Shawn Levy said. 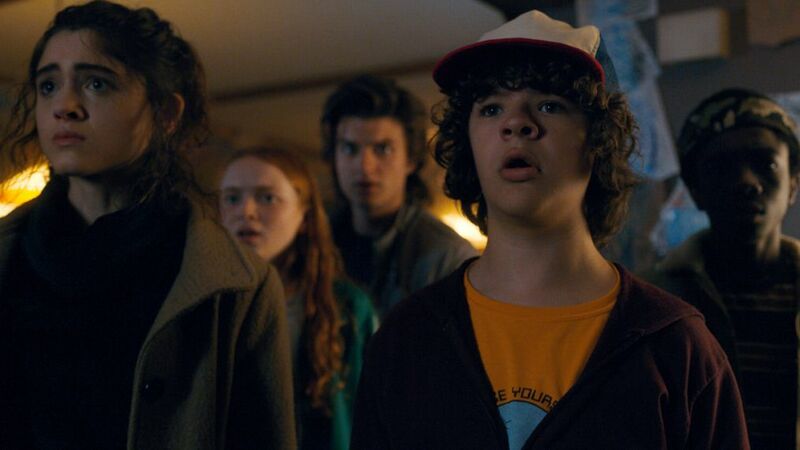 "Mike and Eleven and are going strong, so that's a relationship that continues, and same with Mad Max and Lucas," Levy said to The Hollywood Reporter Sunday and also mentioned that Caleb McLaughlin's character Lucas and Sadie Sink's Max will also be together after falling for each other during Season 2. "But again, they're like 13 or 14-year-old kids, so what does romance mean at that stage of life? It can never be simple and stable relationships and there's fun to that instability," he continued about what fans can expect in the third season of the hit supernatural series. He also said that Season 3 will feature more of Joe Keery's Steve Harrington and his parenting ways. "We'll definitely get to see some more of Steve Harrington in Season 3, and I'll just say we won't be abandoning the Dad Steve magic. I don't want to say much more, but I literally feel that we were walking along and we stumbled onto a gold mine with Dad Steve." Levy's comments come from the red carpet at PaleyFest Sunday which featured a Stranger Things panel featuring the stars of the show. Star David Harbour, who portrays police chief Jim Hopper, shared during the panel how close he has grown to Brown and how he sees her as a daughter. "I don't have a child," he said, "So I don't know what that's like, and all my experiences of love have been romantic, or my parents, or my dog, so this was an unlocking of me as a human being; of a love that was human, but was pure in a way where you'd take a bullet for someone." A female grip accused the showrunners of verbal harassment on-set. "To be honest it was very challenging and we went through so many different emotions," Brown said of the scenes she has shared with Harbour. "We get angry at each other. We're like father and daughter...those scenes were so raw and real." Stranger Things won big at the Nickelodeon Kids' Choice Awards Sunday with the series being voted Favorite TV Show and Brown being voted Favorite TV Actress.